"I am so happy to see how the level of this sport is increasing year by year!" After four years without any PSWC titles, the Italian well-known skater, Tiziano Ferrari (#16) came back on the podium of the 13th edition of the famous Parisian event! He was 3rd in the Battle discipline in 2008, he won the Speed challenge in 2009 and he got two second places during the European Championships PSWC in 2010, in Classic where he was first European skater of the event, and in Speed, where he only lost against Yohan Fort. 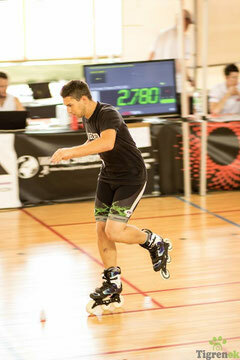 This year, he got two 3rd places in the event, one was for Pair Slalom, which he performed with the young and already very strong Lorenzo Guslandi (Ita, #11) and another one is the Speed Slalom, when he won a consolation final in front the current world number two, Jimmy Fort. Here is a small interview with Tiziano after his successful performance. P.S. It’s your first PSWC podium since 2010. How do you feel about your performance and results? T.F. I’m feeling very proud because during these years the level increased a lot really, and finally I managed to deal with the stress of the competition. Competing with Jimmy Fort is amazing because we respect each other and for me it’s a great achievement. P.S. What do you think about Raphaël Giron? 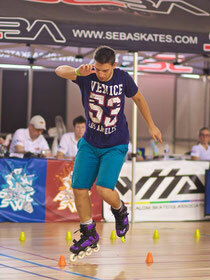 Who is the strongest speed slalom skater for you? T.F. Raphaël is a great discovery: last year he reached great times but had no occasion to demonstrate his level, I didn’t expect him to be so strong. The fastest one is Savio for sure, but the one that makes me nervous is Yohan Fort. P.S. Who impressed you during this event? T.F. Everybody impressed me during this event: Sergey with his new tech combos, Sofia with her Classic performance, Valerio for winning the Battle Junior… but the most stylish performance for me was made by Toni Castro in Classic! P.S. Are you happy with your Pair performance? How do you feel about Lorenzo’s progress? T.F. I’m not so happy with our Pair performance, because I know we can work much better and this time there wasn’t a good feeling: I mean we didn’t train so much so we never expected a good performance. We decided to make something totally new for the next events, I’m sure we’ll do a nice choreography. Lorenzo’s progress is the result of a lot of passion and hard work, I’m happy to see his way of skating. P.S. How did you find the first indoor PSWC? T.F. From a skating performance point of view, indoor is way better, because there’s no weather problem, and the floor is flat whereas Trocadéro is leaning in many directions. Also, here there are all the needed facilities and a training area. But nothing beats Trocadéro from a landscape point of view! P.S. What is the next event for you? T.F. The next event… Battle Ancona next weekend! Sun, beach, good music and good food! P.S. Do you have some wishes for the skaters? T.F. My best wishes to all my friends, so happy to see how the level of this sport is increasing year by year!